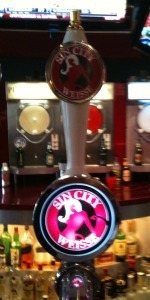 Sin City Weisse | Sin City Brewing Co.
What’s Las Vegas without a little vice? Our traditional German Hefeweizen, Sin City Weisse, is an unfiltered, straw-colored wheat beer with a low hop profile that features a distinct clove aroma and citrus undertones. Originally a summer brew at 4.5% alcohol by volume, it’s a perfect fit for our Las Vegas climate. Sin City is not mentioned as one of the better brewers in Vegas, but this weisse might be the best weisse I've ever had. A cloudy orange colored brew that pours out a snow-white head and with decent lacing down the glass. The smell was weak, but then the feel was about as spot on as you can get. The sweet taste of the brew was added to by the citrusy flavor throughout. Not only was this a nice place to have a brew, but their offerings were top notch as well. Had on-tap at the brewpub on the strip in Vegas. Poured into a pint glass. L: Pours a hazy medium golden color. Thick creamy white head and nice lacing. S: Can you say banana? Heavy banana... cloves and spice. Yeast. T/F: Bananas and faint citrus... very fruity, and nice spiciness with cloves and nutmeg on the tongue. Lemongrass and yeasts. Zesty/carbonated mouthfeel. Finish is clean. O: A slightly off-kilter weiss... very banana heavy and not as balanced as I'd like, but still tasty and on a hot day in Vegas it's pretty easy drinking. Wouldn't mind having it again. Sinfully good. Not as good as lonig or kellerweis but close. So, it's a Hefe, not a Berliner...and at least it tastes like what it's not called...yeah that's as confusing as the name. It's okay, heavy on the banana and clove, kind of low in ABV for Vegas. Another beer to convert your none craft drinking friends. Beautiful infusion of lemon into a crisp heffe. Not to much that you feel that a lemon has been squeezed into the beer after being poured. Sin City Weisse from Sin City Brewing Co.